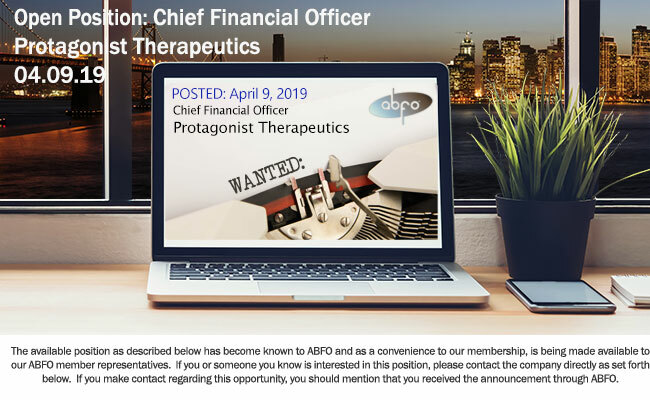 Chief Financial Officer must possess strong business acumen in the bio-pharmaceutical space in the US and a strong financial background. This position is directly responsible for financial operations, revenue accounting, decision supporting, negotiations, risk management and controls. This position is responsible for the leadership of all finance employees and will direct the fiscal functions of the organization to ensure financial efficiency, strong internal controls, effective capitalization, and cost-effective management of resources. The CFO will be an innovative thinker and bring high-level insight and perspective to the analysis and interpretation of the financial results and make appropriate recommendations to leadership. Partner and manage key relationships including the Audit Committee, auditors, various other key vendors and Executive Committee members. Protagonist Therapeutics is a clinical stage biopharmaceutical company that utilizes a proprietary technology platform to discover and develop novel peptide-based drugs to transform existing treatment paradigms for patients with significant unmet medical needs. PTG-200 is an oral peptide interleukin-23 receptor antagonist in development for the treatment of Crohn's disease, and it has completed Phase 1 studies in healthy volunteers. The company has entered into a worldwide license and collaboration agreement with Janssen Biotech for the clinical development of PTG-200. PN-10943 is an oral, gut-restricted alpha-4-beta-7 integrin antagonist peptide that is under development for treatment of ulcerative colitis. Protagonist is also developing an injectable hepcidin mimetic, PTG-300, for the potential treatment of anemia and iron overload related to rare blood diseases with an initial focus on beta-thalassemia.